3-pound aerospace-quality aluminum alloy delivers unbeatable cleaning leverage. 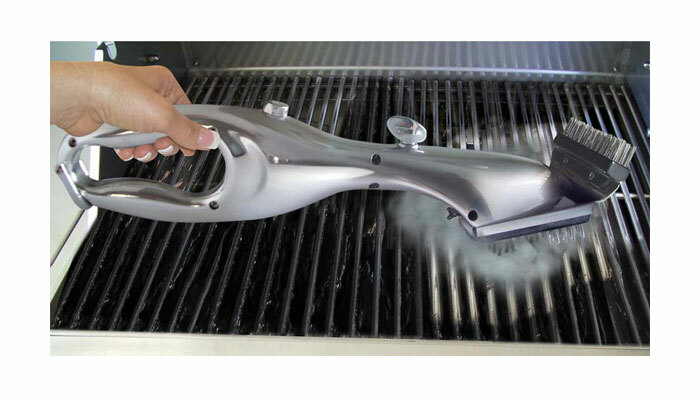 If you're looking for a powerful professional-grade grill-cleaning tool, the Grand Grill Daddy Platinum is for you. Sleek and stunning with its glistening aerospace-quality aluminum alloy body, this brush utilizes the same revolutionary steam-cleaning technology as Grill Daddy's ever-popular original Grill Daddy grill-cleaning brush. So your grill will look like new in no time without harmful chemicals and without backbreaking scraping. Plus, it keeps food tasting great. The Grand Grill Daddy Platinum is the only way to keep expensive new grills looking new. Its ergonomic body design and sleek metal housing provides maximum cleaning leverage while protecting your hands from searing grill heat, even when cleaning the back of big grills. It's built to last and will look beautiful for years due to a special surface coating that exceeds the salt-spray test for outdoor fixtures. It comes with two sets of professional-grade dishwasher-safe brush heads that will also last a lifetime, depending on use. Safe on stainless-steel, ceramic, and iron grills. Brush and clean the grill in a cross-wise direction to bust-up and melt-away even the most stubborn, baked-on residue with the power of steam. No more toxic chemicals. No more back-breaking work. 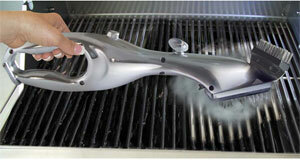 The Grand Grill Daddy Platinum gives you a sparkling clean grill in minutes. Equipped with a handy hang-hook for convenient storage. Note: After each use empty excess water and leave the on/off valve in the on position.